This is the Tamiya 35 017-2800 kit in 1/35 scale, of the ‘German 88mm Gun FlaK 36/37’. The 88mm gun (commonly called the eighty-eight) was a German anti-aircraft and anti-tank artillery gun from World War II. It was widely used by Germany throughout the war, and was one of the most recognized German weapons of that conflict. Development of the original models led to a wide variety of guns. 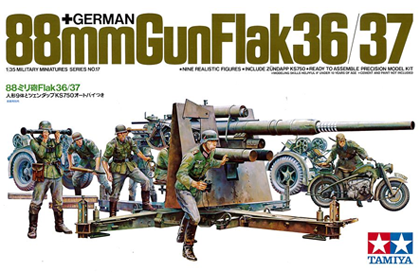 The name applies to a series of guns, the first one officially called the 8.8cm FlaK 18, the improved 8.8cm FlaK 36, and later the 8.8cm FlaK 37. FlaK is a contraction of German Flugzeugabwehrkanone meaning “aircraft-defense cannon”, the original purpose of the eighty-eight. In English, “flak” became a generic term for ground anti-aircraft fire. In informal German use, the guns were universally known as the Acht-acht (“eight-eight”). The versatile carriage allowed the eighty-eight to be fired in a limited anti-tank mode when still on its wheels; it could be completely emplaced in only two-and-a-half minutes. Its successful use as an improvised anti-tank gun led to the development of a tank gun based upon it. These related guns served as the main armament of tanks such as the Tiger I: the 8.8cm KwK 36, with the “KwK” abbreviation standing for Kampfwagenkanone (literally “battle vehicle cannon”, or “tank cannon”). This entry was posted in Kits, Stash and tagged 017, 1/35, flak, flak 36, flak 37, flak gun, flugzeugabwehrkanone, german, kampfwagenkanone, tamiya by Thomas. Bookmark the permalink.